DIAL: Black dial in excellent condition signed Jaeger LeCoultre. Black central disc with world time cities. Original hours and minutes silver sword hands with white central sweep seconds hand. 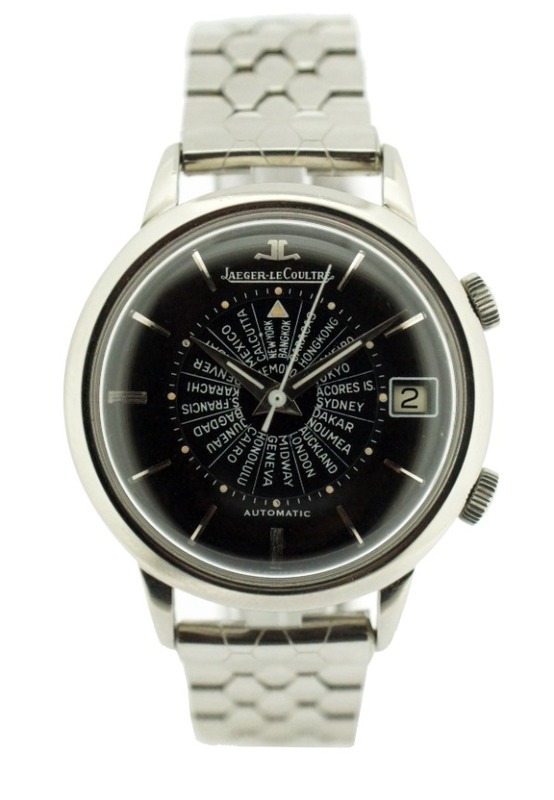 The Jaeger LeCoultre MEMOVOX is known as the original automatic alarm watch. The first MEMOVOX was released in 1950 with the hand-wound mechanical caliber 489. The MEMOVOX name is composed of two Latin words ‘memo’ and ‘vox’ that respectively mean remember and voice. In 1956, Jager LeCoultre released the Caliber 815 Memovox, which was the first automatic alarm wristwatch with its signature ‘bumper’ self-winding movement.